Peplum Lehenga Styles have been trending in wedding fashion for a while now. From brides to brides sisters, every girl wants to wear some peplum style lehenga to the wedding functions. 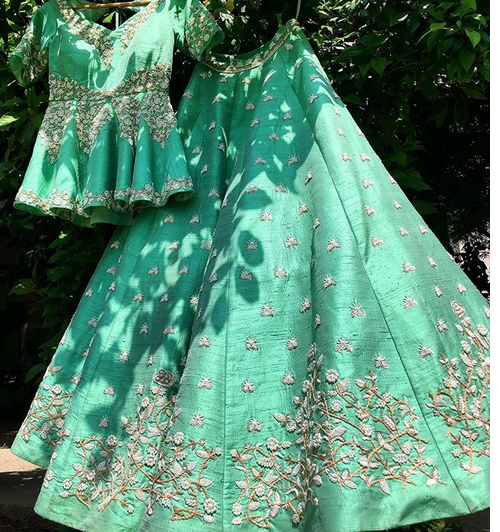 In this post, I thought I will share all the Peplum Lehenga Styles inspiration along with details on where you can buy these from. 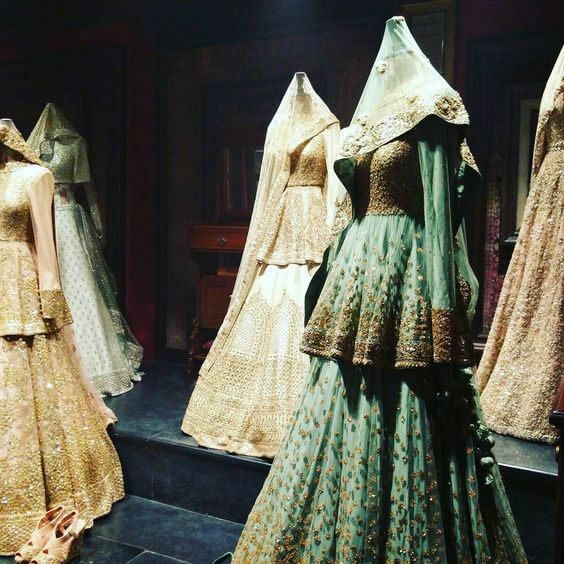 Sabyasachi was the first designer I truly saw bring peplum style to mainstream wedding fashion. Remember pregnant Kareena Kapoor walking the ramp wearing a peplum lehenga? She looked gorgeous, and it made me realize one thing. For all you brides who are not too confident about showing your mid-riff, this is a nice cover-up option. It looks great as it gives extra embroidered designs on the border and overall gives a more elongated look. You can simply opt to wear a sheer net dupatta and voila, you’re set. I think this particular bride is wearing a Sabyasachi pink gold peplum bridal lehenga. 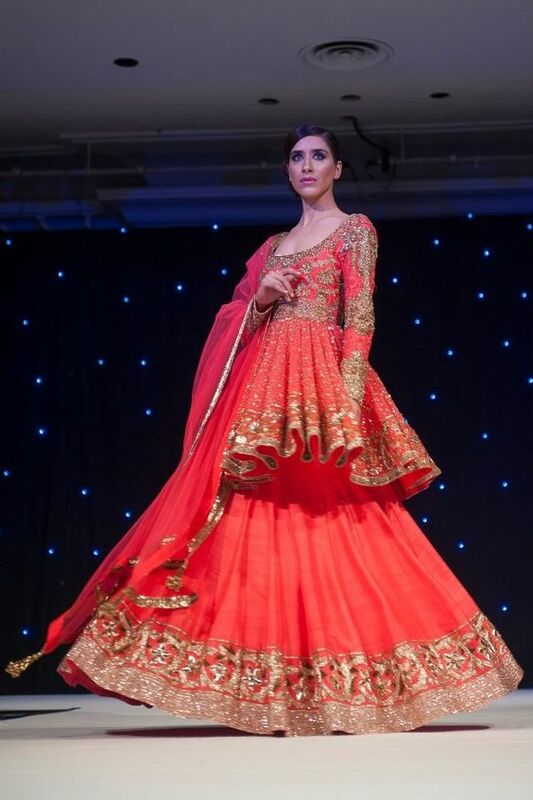 The Peplum Lehenga Styles in these photos is a straight symmetrical one length peplum blouse i.e. the same length runs front and back. I wouldn’t know if it is a replica, then that’s a different story. But it very much looks like a Sabyasachi. If you are wondering what this gorgeous Sabyasachi peplum lehenga costs, I think it’s safe to say it will be in the INR 3.5 Lakh + range. This particular Peplum Lehenga style is more prominent in Pakistani designer lehengas. I saw a lot of premium designers showcasing short front long bottom peplum style blouse. You can opt to go for a really low back on this one, and let the heavy embroidered blouse bottom take the rest of the attention. This sort of style looks good if you don’t opt for a full flared cancan lehenga skirt. Don’t get me wrong, you may end up looking like a balloon if you fluff it up. Sabyasachi was truly the first designer who brought the peplum lehenga style in fashion. 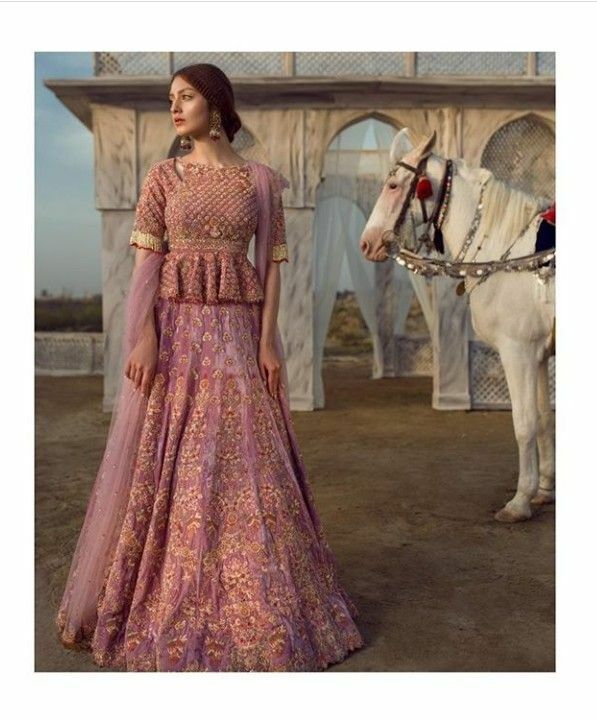 It does take a minute to get used to this type of a lehenga design. Traditionally we have always seen a lehenga with a choli. But come 2018, Peplum Lehenga Styles are still very much in fashion. 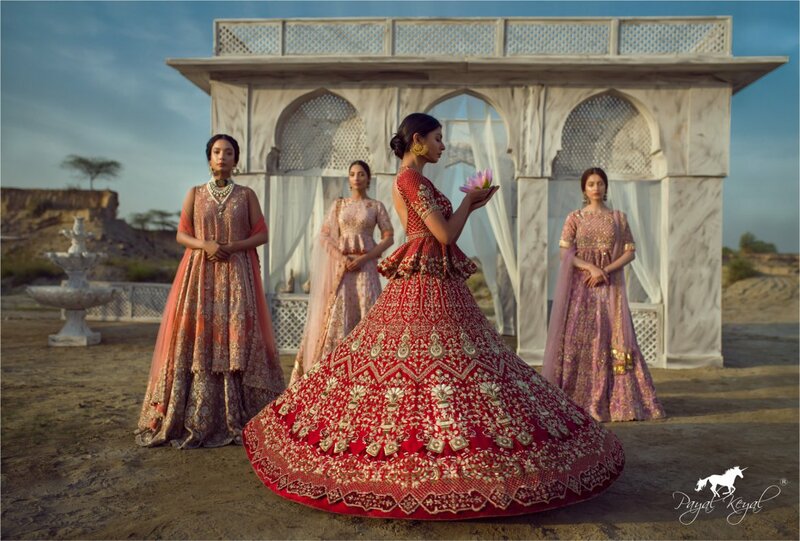 So if you are looking to score a gorgeous peplum lehenga for your wedding, there is no better place to shop that from Sabyasachi himself. 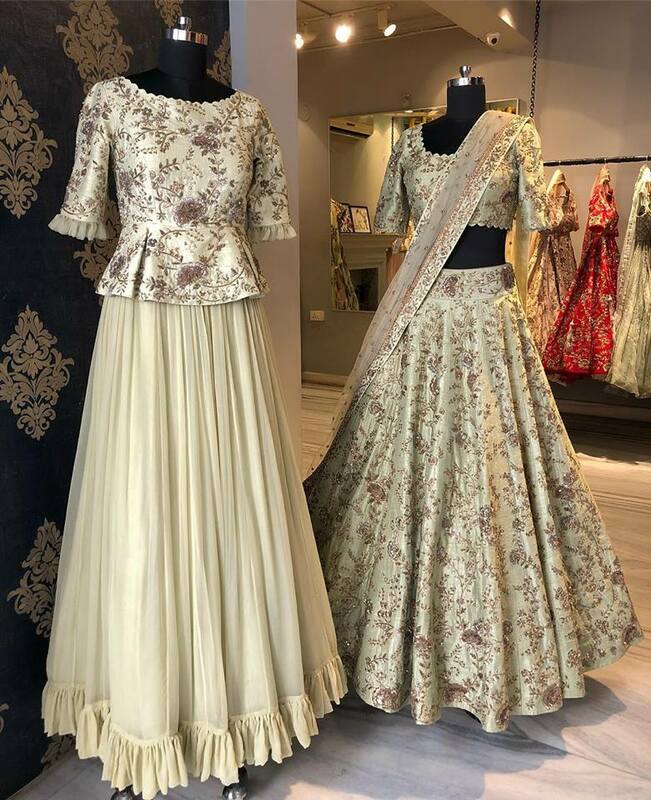 If you want to go for a more casual ethnic look say for a pre-wedding party, or to your best friends wedding, then these peplum lehenga styles are perfect for the occasion. 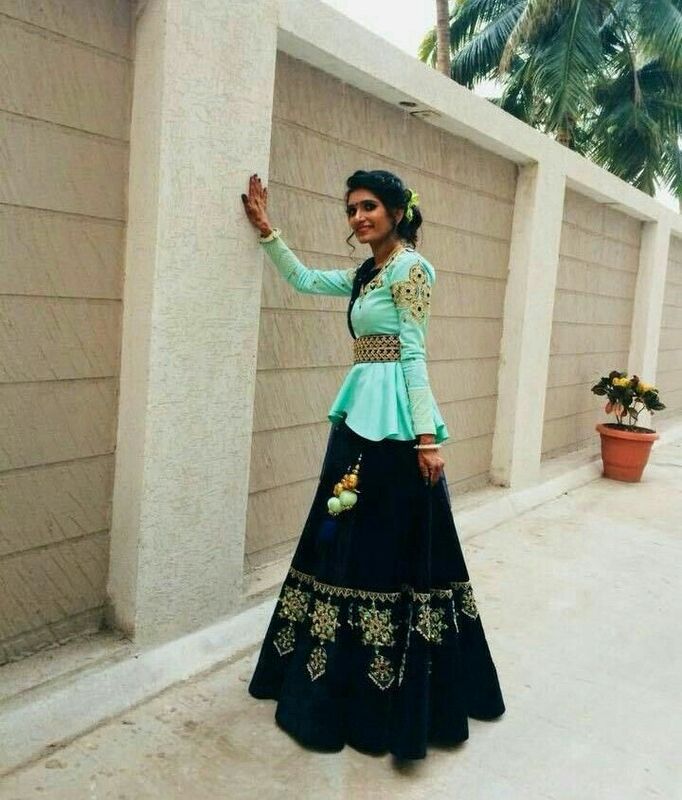 The simple lehenga skirt teamed up with the embroidered heavy peplum blouses brings the perfect balance. It’s a fun outfit, which doesn’t really require a third element to it, like a dupatta. You can do minimal jewellery with this look. Choosing the right colour in this style is key to making the outfit tick all the boxes. 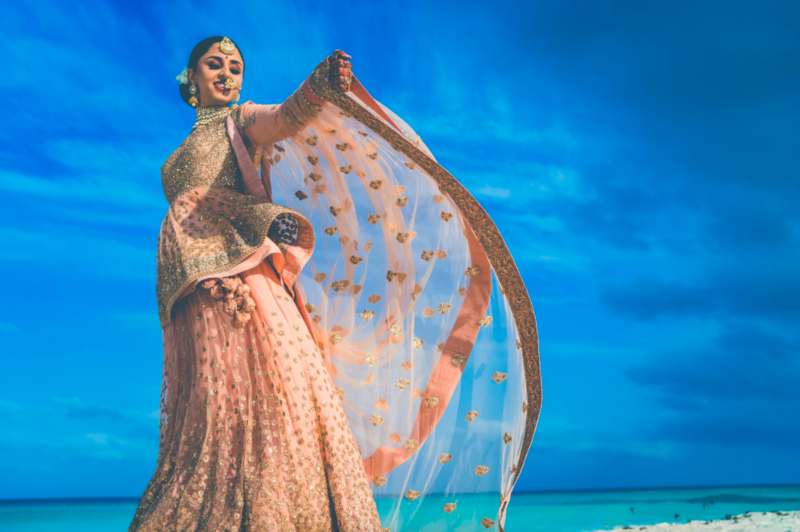 Mrunalini Rao lehengas usually cost anywhere above INR 60k to INR 1.1 Lakhs. 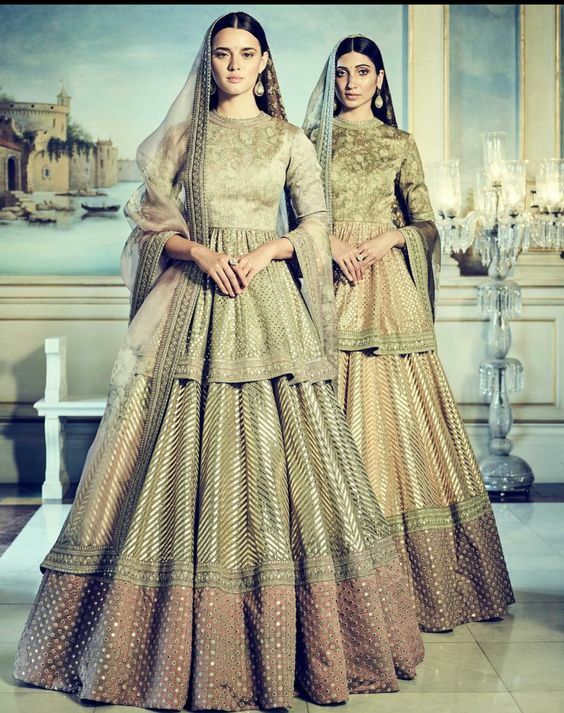 You can shop her designs online, and all of these peplum lehenga styles prices are available on multiple websites. If you want to see versatility in any designers creations, go for Jayanti Reddy. She is the queen of peplum ethnic wear outfits. Long, short, silk, non-silk, scallop, asymmetric, you will find a ton of options to go with your lehenga. The designs are expensive. 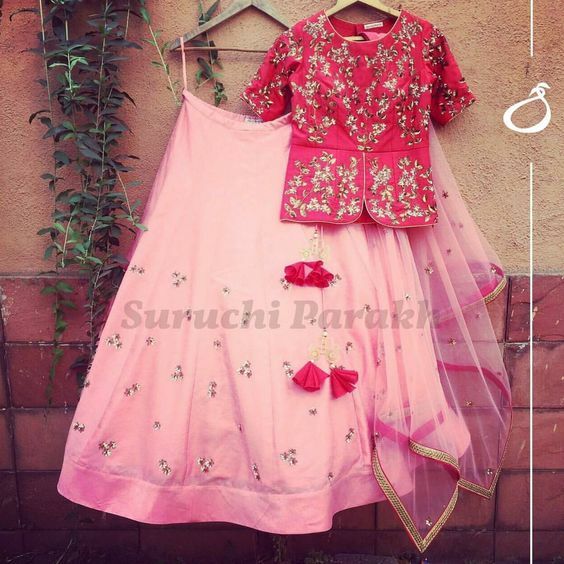 Think INR 1 Lakh plus for basic lehengas. But if your budget lets you, then Jayanti Reddy would be my recommendation to you. So I found this one lehenga that really caught my eye. We all love twirling in lehengas, but can you imagine your blouse having its own flare story? Pretty amazing isn’t it? If you opt for any fabric other than silk, you should be able to achieve the full glamorous flared look at your wedding. 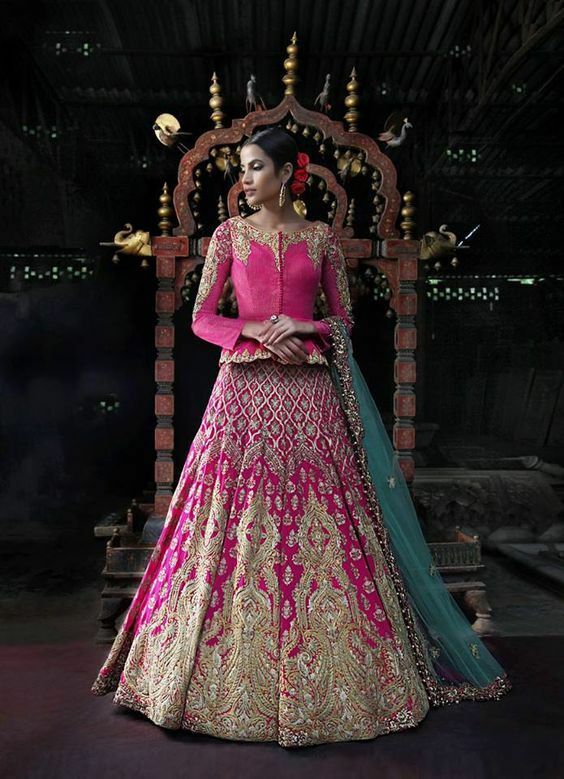 If you don’t want the peplum to be too prominent, then this peplum styled lehenga is a good choice for you. Short and sweet, you can barely notice it, and yet it makes an impression. Asiana Couture’s latest 2018 bridal lehengas inspired from Pakistani bridal fashion has a whole lot of these in all possible colours and patterns. They are known for their knack for customisations, so in case you’re a fussy bride, you know where to head to. I absolutely love every single look from the four above. Different in its own cutesy way, you can choose to tone down or bring it a notch up with accessories like jewellery, clutch, belt etc. Just use any of your plain lehenga skirt lying in your closet and team it up with a nice embroidered peplum blouse. Papa Don’t Preach is well known for it exquisite designs. Anybody looking for fun, flirtatious girly-candy colour lehengas with a whole a lot of oomph, will love what they have to offer. Personally I love brides who opt for this label for their mehendi or sangeet parties. Solid monotone lehengas are amazing choices for pre-wedding functions. Ridhi Mehra has a good collection of peplum lehenga styles in every budget. Since, it is designer lehengas, your budget needs to be at least INR 50k plus to shop at any of these designer boutiques. But overall, this post is just to give you an idea of what styles you can opt for in peplum lehengas. I haven’t met a single woman who doesn’t love soft pastel shades for lehengas. They have been in trend since years now, and if you want to wear pastel in peplum style, then Devnaagri should be your pick. They have beautiful, delicately designed lehengas that are not your bridal category, but fit quite well in the pre-wedding segment. These two in the picture are probably the same lehenga, I am not entirely sure. But I did find two different pricing. The reason why I added both the pricing was just to let you know that you need to check multiple websites before making any kind of online purchase. Especially, big ticket items like lehengas. 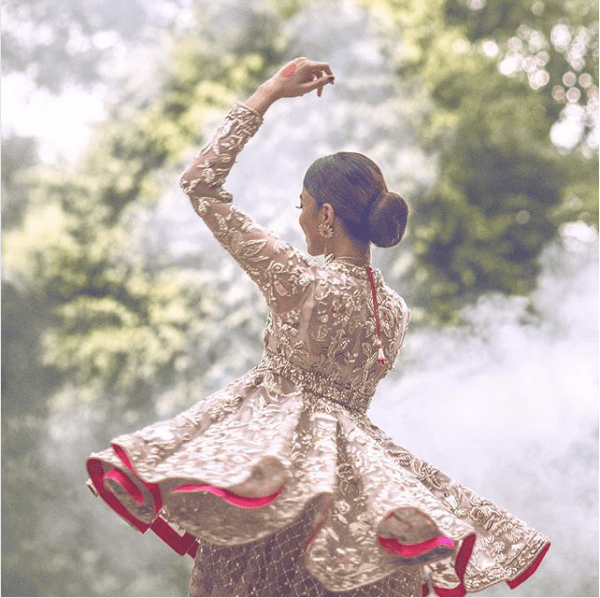 Which peplum style lehenga was your favourite in this post?